In part 1 we covered PLUS, Options, Cookies and File Types, this section will cover the rest of WinPatrol. On any of the tabs mentioned in this section of the tutorial with the exception of the Services tab you can right click on the program name and a menu will pop up giving you all the button options for that tab but also the option to "Delete File on Reboot." It is one way of removing the malicious content from your computer. Once your system is rebooted the file will be removed before Windows starts any program that could prevent the deletion of that file. Please be sure that any file you plan to delete is not a file needed by a valid program on your computer, you can't get the file back after deleting it. Can I permanently disable a program from getting on my startup list? Yes, when you disable a program in WinPatrol it will automatically be removed when it is detected in the future. We discovered many programs like Quicktime, RealPlayer and MSN Messenger that think they're so important, they put themselves in the startup list anytime they run. Just leave these programs as disabled and Scotty will remove them for you every time they reappear. Have you ever had an annoying program that insisted that it belonged at startup no matter how many times you tried to stop it? Why on earth are you letting it happen? Install WinPatrol and let Scotty take care of that headache! Those who know me know just how much I despise Quicktime and RealPlayer. If you insist on using them, please know they are not needed on startup and Scotty the watchdog will keep guard and stop them from doing what they should not be doing which is tying up your available resources. Bill and I will have to agree to disagree about MSN Messenger, I see it as a tool to help others and think it does belong in startup, remote assistance needs either MSN Messenger running or Windows Messenger running, so in my line of work I find Messenger a required program. It is not only valuable for helping clean an infected computer, it is also a wonderful tool for visual teaching, I can teach someone miles away, without messenger I would not have this opportunity. But the main point is that if you have a program that insists it belongs in startup and you know it does not Scotty will make sure that your wishes are granted, instead of removing these be sure to allow them into startup and then disable them. The IEHelpers tab lists any browser helper objects or toolbars that have been installed on your computer. If you are not sure of the program you can click on the Info button and it will bring up a new window that will give you a bit more information about the program (see screenshot on the right). If you are not a PLUS user you can get information on a file by using BHOlist. Are you beginning to see all the tools you are going to have to use if you are not a PLUS user? The advantage of being a PLUS user is that answers to your questions can be very easily provided for you by simply clicking a button rather than having to run a few different programs or find the answers by searching the internet. Being a PLUS member makes it so much easier for those with a thirst for learning about what is running on their computer! With WinPatrol it's a matter of clicking on a button and the browser is opened for you with the information right there. Without WinPatrol PLUS you will have to open the browser yourself, go to one site to find out what you can about exe files then to another site to find out about BHOs and toolbars. That's a lot of unnecessary work when you know that it can all be accessed so easily for such a small cost which provides you with the PLUS version, one time only, all upgrades are free. The Scheduled Tasks tab provides you with a listing of tasks you have scheduled to run on your computer. It lists the name of the program, the program filename, when it was last run and when it is scheduled to run again. If you prefer to schedule your tasks rather than run them manually, you will find them in this list. WinPatrol does give you the option to remove the task if you no longer want it to automatically run by clicking the Remove button. If you click on any of the buttons above it will show you the shot of that WinPatrol screen. The Services tab lists all services that are present on your computer. Whatever you do, don't pay attention to any of the settings that show in the Services tab in the movie above because I've been testing and playing to find out exactly what some of the services do and if they are really needed or not. If you just want to view the services that are non-Microsoft just check the box beside "List non-Microsoft services only". If you highlight one of the services and then click the Info button another window will pop up like the one shown at the right. 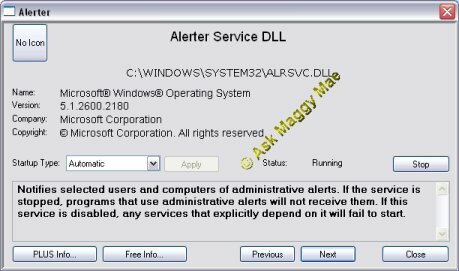 As you can see you are given the option to stop or start the service and you are given the option to change the Startup Type, you can enable, disable and Automatic. One thing about this tab that stands out the most for me is the list of files under the Command section. If you've ever wondered after seeing a HiJack This! log or viewing the Task Manager, why on earth are there so many instances of svchost.exe running on your computer, this tab will show you what svchost is controlling. You are not just provided with that filename, but also with the filename that is relying on it to provide the service. Now it becomes clear why there are so many instances of one file running at the same time. The Active Tasks tab lists all the tasks that are currently running on your computer. If you are anything like me that list will be rather long. You can stop any of the active tasks by highlighting the one you want to stop and then click the Kill Task button. This works the same as using the Ctrl+Alt+Del function to stop an active task. Now that we have covered all the tabs on WinPatrol, I would like to show how running this is valuable. My first thought is WinPatrol gives the computer user much more control on what is being installed on their computer. Programs can't install themselves anymore without being caught by WinPatrol. Think about how many malicious programs that are out there that in the past could without any problem sneak onto your computer and start causing you problems. When they have to face Scotty, they haven't a chance! Secondly, wouldn't it be much better for the computer user to actually know and learn what is going on inside their computer? If you look close enough at WinPatrol you will see that by using it you are eliminating the need to rely on others to tell you what is going on with your computer. You think something is wrong and you go to a forum and post a help message and you are asked to run HiJack This and post it to the forum, (then quite possibly your log goes unnoticed because these forums have taken on far more than they can handle) but do you know that you can do much of this on your own with the help of WinPatrol? Do you have the desire to learn what is good and bad on your own computer? Well if you are running WinPatrol PLUS you have that option without having to rely on me or anyone else to tell you what is going on, let WinPatrol teach you. Think I'm crazy? Watch for the Hijack This tutorial showing you how you can diagnose your own logs.